Joe Levy wants to begin reviving the Gottschalk brand in Clovis, opening the first in a chain of “leaner and meaner” department stores on Nov. 1. The former Gottschalks store in Sierra Vista Mall would become the flagship store and corporate headquarters for “Gottschalk by Joe Levy Inc.,” a company created by the now-defunct retailer’s former CEO. The new retailer uses a variant of its predecessor’s name to avoid legal concerns while promising to bring back the kind of store many Valley shoppers still love. 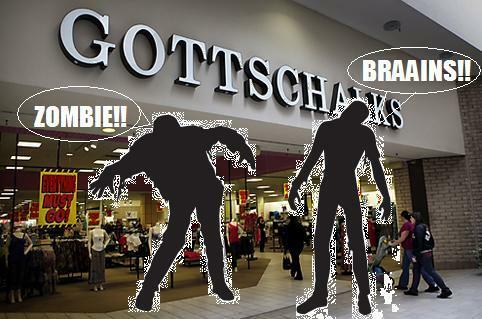 I, for one, welcome our new zombie retail overlords! Gottschalks was kind of a quirky old store to have around and this type of thing doesn’t happen often. What? That is crazy that they are coming back? I think it’s great. I’d love to see some of the classic Northeast department stores like A&S, Jordan Marsh and Hahne’s come back. Gottschalks? Coming BACK??? We can either fear this or embrace this! Here in southern New England, the former Bernie’s appliance chain owner is trying to do something similar to this, except he bought the Bernie’s name out of bankruptcy. I think the first store is opening in Manchester, CT this summer. I’ll be curious to see if this becomes a trend in the next few years. It’s a tossup…I’d like to see Gottschalks come back and repopulate malls again, but after seeing the exploitation of the name of Circuit City, Montgomery Ward, Fortunoff, and Service Merchandise, I think some names ought to go to rest. @Pseudo3D, how are these brands exactly being *exploited*? Their website presences are more or less consistent with their old brick and mortar mission. And keep in mind, this is being spearheaded by a team of the original Gottschalks executives, not some outside group. Good point. I think that Circuit City and CompUSA are the worse offenders, just doubles for TigerDirect.com and selling merchandise different from what they sold. TigerDirect.com and CompUSA should be different stores, not two nameplates. Service Merchandise is actually an acceptable attempt (I think it was made by the Zimmermanns) but the “modern” Montgomery Ward.com just isn’t Montgomery Ward, and Fortunoff is selling backyard furniture instead of fine jewelry. @Pseudo3D, I think the problem with the current Montgomery Ward is that they only sell clothing and home accessories and not other things such as electronics and appliances. It’s a good development for Gottschalks fans, but you have to wonder if opening a new middle-market department store in this economy makes sound financial sense. @Steven Swain, I agree, though I am guessing that the space is relatively cheap. They seem to be planning to return mainly to smaller markets and in second/third tier malls and shopping centers, and all of these markets are also some of the areas most heavily impacted by foreclosures. Not a market most chains want to go in, but it’s one where the Gottschalks nameplate has a lot of value still. Again, I think the appeal here is mainly towards older consumers who are largely underserved. @Caldor, To make it viable, Gottschalks is going to have to be super-focused on their markets. if they go upscale or try to court a younger demographic too obviously, they’re going to have some problems. @Steven Swain, I tend to wonder though if the “grandma’s store” scheme works. I’ve watched such stores become a big lead weight on both stores and malls both, but then again the Belk at Shelter Cove just expanded and is wildly successful with the silver crowd despite the fact the mall around it is in serious trouble. @JT, It doesn’t work everywhere, but sales data form the key players in that market proves that Grandma wants clothes to fit her lifestyle at reasonable prices and is extremely loyal to whoever will consistently supply her. From what I have seen, Gottschalks and other “rural” department store chains definitely have their following. There are a lot of people who don’t like the selection, pricing, or general vibe of the national chains, especially when one not suited to more exurban/rural areas like the CA Gold Country or Central Valley try to come there. Macys and Forever 21 are more “citified” than what a lot of people in these places want. I think it could work, but it will be hard to compete against the store that has largely replaced department stores for most rural shoppers’ clothing and general merch needs, Wal-Mart.